After taking my little one to skating practice this morning, lacing up her skates and listening to the details from a sleepover party last night, I went out to the car and found a penny in the parking lot. As I have written about before in this space, I picked it up and looked at the year the penny was minted. And the year I saw–1986–may well have been the most momentous one in my life to this point. In fact, it was the turning point. The picture above shows me as I was in 1986. I’m in the middle column, at the bottom of the page. 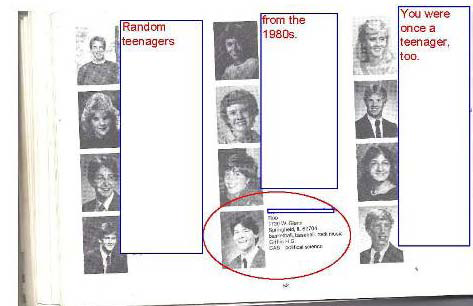 The picture was taken by a local photographer, and it appeared in my high school yearbook as well. Seniors had their pictures published in color, while everyone else had to settle for smaller pictures in black and white. Rank has its privileges, both then and now. The book that this page was taken from appeared in was what we all called the “Freshman facebook.” It’s funny how today everybody knows about Facebook in a different sense. But I, and all the rest of my classmates, were in a facebook of a different sort. And this is helpful for getting at who I was back then. My name appears along with my nickname and home address. I never actually lived in Springfield, Illinois, but in a small village–a suburb, actually–that bordered Springfield. In hindsight, I wish I had just put Jerome, Illinois as my mailing address, since it did set me apart from nearly everyone else that I knew back then. But setting yourself apart from the herd is not something that the 18-year old version of me wanted to do. Thankfully, I’m more willing to do that now. Below my address (and somebody lives there today, but not me or my family) are my interests which, if I had been completely honest about it, would have also included drinking beer, but I couldn’t publicly own up to that. The interests that I was willing to share with all of my soon-to-be classmates are kind of funny: basketball (Larry Bird and the Boston Celtics, particularly), baseball (anyone who’s ever read this blog knows about that), and rock music (see yesterday’s post about Van Halen’s tour for evidence of that). The basketball interest has faded somewhat, but the other interests are still right up there, a quarter of a century later. Below my interests are the place I graduated from high school (which no longer exists) and my intended major. I viewed political science as my pre-law major, and even though my school didn’t have a pre-law curriculum, I had every intention at that point in my life of becoming a lawyer some day. Fate had other ideas, as it so often does, but without fate I wouldn’t have been in Northwestern’s freshman facebook to begin with (there’s more about that here). I drove home from the skating rink, turning 1986 over in my head, and thinking about how different I am from the person who occupied that space at the bottom of page 52. I wondered what the 2012 me and the 1986 me would say to each other. That sort of thing pops up on Twitter every so often, with a hashtag like “#thingsIwouldtelltheyoungerme.” I have become, in many ways, what the younger me wanted to become, but would never say so publicly. I’ve lived into my 40s, which I’ve learned that not everybody gets to do. I have a family, with a wife and a dog and two kids I would do anything for. I also own a house in a historic part of a city that I love almost as much as my family. I drive two cars–a hybrid and a minivan–which didn’t exist back in 1986 but serve their purpose very well. I have seen some of the world, which the 18 year me had not yet done. I have a career that has allowed me to do some interesting things, while not also consuming my every waking moment. I drink coffee–which the 18 year old me would have thought impossible–but I don’t drink alcohol, which the 18 year old me would have though equally as impossible. And I still love rock and roll, and am looking forward to concerts by some of the same performers that I listened to back then. The 18 year old me would have really loved the Loop. The place I’m at in life today is the result of the course I began charting back in 1986. 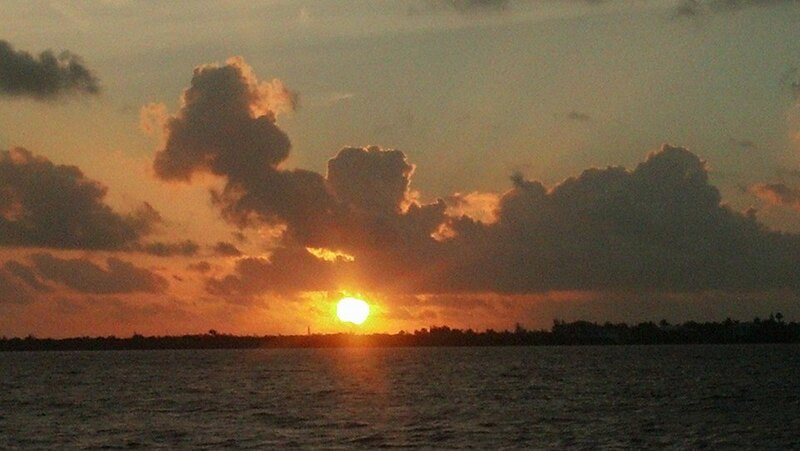 I was on my own, for the first time in my life, and I enjoyed all of the freedoms that came with this. But I stayed on the path, not knowing where it was going to end up. And this morning–as I’m hearing my older daughter laugh with a friend in the next room while writing down some thoughts to share with the wider world–I must say that I am happy with how things have turned out. One of my favorite songs back in 1986 was “Foreplay/Long Time” from Boston’s debut album. The lyrics of that song include the lines “I’ve got to keep on chasing a dream/or I may never find it”. I left my parents home in 1986 to chase a dream that I couldn’t define very well back then, but what I’ve found since then fits the bill better than anything I could have imagined. I’m not a millionaire or a celebrity or anything that a typical 18 year-old fancies himself to be one day, but I am a middle-aged, middle class dad who knows what really matters in life, and has everything that he needs to have. And I’ll take that every day of the year. I was born in Springfield, Illinois, in a hospital that’s just up the street from where Abraham Lincoln lived for most of his adult life. Lincoln wasn’t born there, didn’t grow up there, and didn’t die there, but he did spend a good part of his life there. Or, as he said in his farewell address to the town, he passed “from a young man to an old man” there. And he lies there still. There have only been a handful of presidents in American history, and I wonder if any of the others are as closely identified with their hometowns as Lincoln is. I rather doubt it, since the men who have grown up to be presidents are usually born in one place, more around at least a little bit in their lives, and win the presidency when they live someplace else. For instance, Ronald Reagan was born in Illinois (the only president who could say that), and then lived in several small towns around Illinois. But nobody knows that about Reagan. He’s associated with California, instead. President Obama lived in Illinois when he was elected, but I don’t think there’s any danger that Illinois will ever be called anything but the “Land of Lincoln.” Lincoln owns the place, metaphorically speaking, and probably always will. 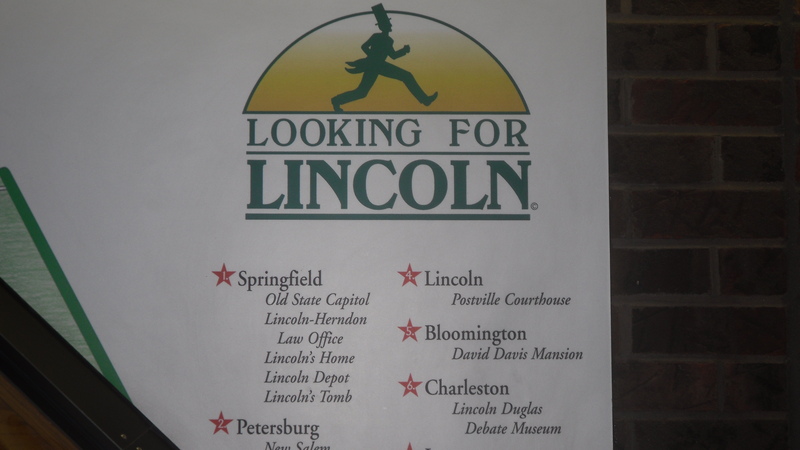 Every town and city in America has at least a few businesses that are named after Lincoln. And, in all likelihood, they aren’t named for business owners like Jack Lincoln or Fred Lincoln or even Seamus Lincoln. As a surname, it’s just not that common. So a business enterprise that calls itself “Lincoln Plumbing”–such as the one I found in Reading, PA during a random Google search–is hoping that your feelings about “Honest Abe” gives it a leg up over all the other plumbing companies out there. In Springfield, this is taken to a whole new level. There’s Lincoln Yellow Cab, Lincoln Tower Apartments, Lincoln Greens Golf Course, and many, many others. And these are in addition to Lincoln’s Home, Lincoln’s Tomb, the Lincoln Presidential Center, and on and on. When your most famous resident may just be the quintessential American, why not?